After a rocky end to 2018, investors are picking themselves up in 2019, but rather than deep-diving into the capital markets headfirst, they're picking their spots and deploying capital more strategically. This is the case for all asset classes, whether it's equities or fixed income. The go-to bond play for broad-based exposure is the iShares Core US Aggregate Bond ETF (AGG) , which tracks the investment results of the Bloomberg Barclays U.S. Aggregate Bond Index. The AGG gives bond investors general exposure to the fixed income markets, but there are times when current market conditions warrant a deconstruction of the AGG. "Speaking of value, I would also say though that for investors who actually are looking for a true kind of play in the factors space," said Rogers. "We've been talking a lot about value. It's been beaten down pretty hard, a lot of people see the relative valuation as an opportunity going forward." One ETF in particular that captures the essence of value investing via quality is the JP Morgan US Quality Factor ETF (JQUA), which tracks the performance of the JP Morgan US Quality Factor Index. For an overall value play, Rogers recommends investors look at the JP Morgan US Value Factor ETF (JVAL), which tracks the JP Morgan US Value Factor Index. 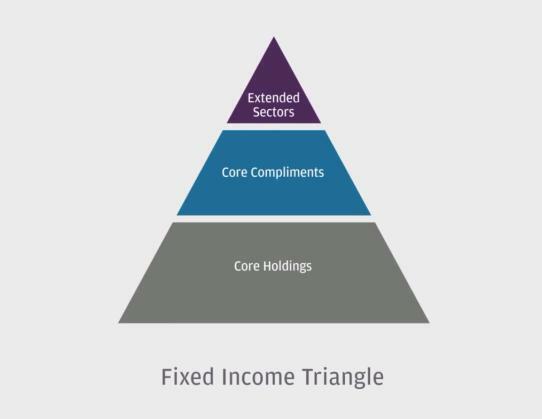 When it comes to building a fixed income portfolio, Rogers cites the "Fixed Income Triangle" as an exemplary framework investors should follow in order to extract the most out of these portfolios. "It's three components--your core, which is kind of like the base of your triangle which gives you that correlation benefit to equities," explained Rogers. "The middle which we call 'Core Complements.' That's exactly where those ultra short duration type of strategies play. Then the top which is the extended sectors. Those are ways where you can sprinkle in a little high yield, a little emerging market debt to get a little bit more income." Investors can look at actively-managed funds like JP Morgan Ultra-Short Income ETF (JPST) , which can serve as a flexible tool during times when rates are decreasing or rising. The floating rate component of bonds in JPST’s debt portfolio would effectively hedge against interest rate risk and capitalize on any short-term rate adjustments the Fed decides to make through in 2019. The AGG gives bond investors general exposure to the fixed income markets, but there are times when current market conditions warrant a deconstruction of the AGG to extract maximum investor benefit--one way is through factor-based methodologies inherent in the JP Morgan US Aggregate Bond ETF (JAGG) . "I think one of the key points of that, that we are seeing actually is that within the corporate part of the Barclays AGG, we have seen so much issuance in the lower end of the investment grade spectrum," said Rogers. "Think of the BBBs--those are the issuers who might have a little trouble if rates start to rise more and they need to refinance debt." "We believe that using value, quality and momentum within issuer quality for corporate (bonds) can make a world of difference," Rogers added.